Kicking off my holiday gift guides with some beautiful and perfect gift ideas for the pink lover in your life!! I have the Ugg slippers in gold and I want to get them in pink so bad. I told my sisters that’s what I wanted for Christmas…we’ll see if they get them. Hopefully they’re reading this ;). Hope this inspires a gift for someone you love!! The cutest gift guide! I’m a lover of anything pink! The most ADORABLE pink pieces of all. Love♥️it! JOYEUX noel beautiful! Adore that pink cable knit sweater! This holiday gift guide was MADE for me! I love it all! Beauty bio have some amazing products? The pink slippers are so cute. 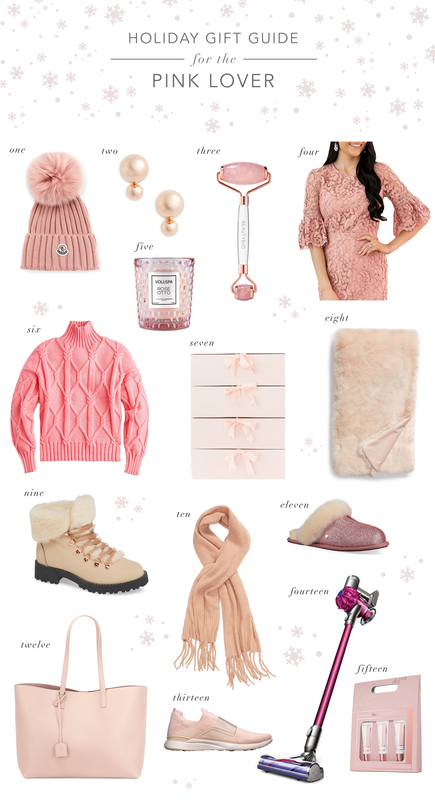 This is a great gift guide for someone who loves pink. thanks for sharing. love all the pinks! that beanie is the cutest! Hi! I waS hoping you could tEll me tHe type and color/nAme of the hardwood floor you had in yOur previous home? (The French country home with blue windows) We are building a house and want a similar lOok. Thanks! !